Choosing a perfect destination to visit in Croatia is not easy. Many find it difficult to decide whether to go Istria or Dalmatia. 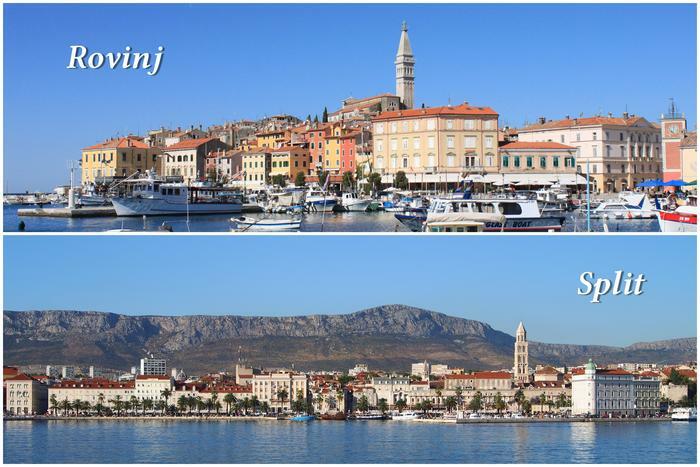 If you're one of those - don't worry because we've compared for you two beautiful cities of these regions: the romantic city of Rovinj in Istria and the historical city of Split in Dalmatia. Both cities are known for their beauty and that special Mediterranean charm of their narrow streets, ancient monuments, red roofs and quaint little galleries and cafes. If you visit Rovinj you have the beauty of the largest Croatian peninsula at hand and you can explore other famous towns such as Pula, Motovun and Opatija, as well as the charming inland part of Istria. If, on the other hand, you opt for the city of Split you'll be an easy distance from Trogir, Zadar and even Dubrovnik. Besides visiting these ancient cities, from Split you can make a day trip to Krka National Park and Plitvice Lakes which are considered to be must-see attractions in Croatia. All along the Adriatic coast there are numerous beautiful beaches and hidden coves. The beaches of Rovinj riviera are mostly pebbly and suitable for small children due to their crystal clear sea and natural shade. Book apartment in Rovinj and you can enjoy the view of the city and the Basilica of St. Euphemia from the lovely Porton Biondi beach. Split also has great pebbly beaches surrounded by Marjan hill pine trees, as well as the famous sandy Bačvice beach where you can always play the most popular summer ball game - picigin. Rent apartment with a sea view in Split and explore all the beauty the city has to offer. Split is the second largest city of Croatia and the largest one on the coast. Due to its central position it's well connected with islands and other cities so it naturally offers a wide choice of various tours, day trips and activities. If you want to visit a beautiful historical city but you're also looking for an active holiday with lots of fun options then Split is perfect for you. If, on the other hand, you want to spend your holidays in a romantic, picturesque town surrounded by lush nature - choose Rovinj. It's just the perfect size for everyone who's looking for a more peaceful summer holiday in a city of rich cultural and historical heritage. Diocletian's Palace is the historical heart of Split. In Rovinj, the same role is given to the beautiful Basilica of St. Euphemia. The Palace in Split is 17 centuries old so it's a fascinating monument of the city's turbulent history - since its founding to this very day when people still keep living and working in it. Just like Split, Rovinj also has a long and rich history. Before it became part of the Roman Empire it was settlement of the Illyrian tribe Histri so it's no wonder that every corner of its charming old narrow streets tells stories of the times long past.